Wickham in his first appearances on the show is very much as he is in the original novel: a friendly, attractive, athletic (soldier in the original, swimmer in the update) young man visiting town, with a beef against Mr. Darcy that he is willing (more than he lets on) to divulge to Ms. Bennet. He seems the most gentlemanly on first appearance (in LBD, he kindly covered a bar stool with his jacket so Lizzie wouldn’t have to sit in beer). He is quick enough to handle Lizzie’s wry banter and “crazy” behavior, and is very nice to her sisters. But there are inconsistencies – he fears Darcy when he supposedly has no reason to, and, upon leaving town, starts courting other girls. Only later is he revealed to have twisted the truth about Darcy – having blown the money trusted to him by Darcy’s father, Wickham was denied any more money, and used Darcy’s little sister to get back at him. Basically, a lying scumbag. But here’s where the plot diverges from the original. After an argument with Lizzie over her lack of responsibility, Lydia, the youngest of the three* Bennet sisters, goes to Vegas for her twenty-first birthday. There, she gets into some kind of trouble and “runs into” her sister’s ex-beau (she is aware, at that point, about how he wasted his money, but not what he did to Gigi Darcy). The details of this meeting never come up, but with Lizzie in San Francisco, Jane in L.A., and neither watching her videos in order to give her space, George and Lydia kindle a relationship. What unfolds over the next 8 webisodes (The Lydia Bennet 22-29) is, in a word, disturbing. Wickham becomes Lydia’s confidant, acting “protective” of her. He confirms he blew his money, but twists it to make it seem like he just made a mistake and Darcy couldn’t be understanding – reflecting Lydia’s own mistakes, and Lizzie’s reaction to them. He makes Lydia doubt her sisters, especially Lizzie, and place all her trust in him. He tells her exactly what she wants to hear, and but simultaneously picks at her faults, making her feel less about herself. The viewers watch the color literally drain from Lydia, her voice becoming softer, as George becomes more enmeshed in her life, pressuring her with the added weight of the internet audience watching. And this is Lydia on Wickham. Many viewers were stunned by how close LBD‘s portrayal of Lydia and George came to a real emotionally-abusive relationship. But some, at least until George actually yelled at Lydia, thought he had changed for the better, and that he really cared for her. They bought into Wickham as much as Lydia did, showing just how good he is at feigning affection. The general audience reaction, however, was affected by how many of the viewers knew the Wickham of the source material, so most (including me) knew that something bad was on the horizon. And then, on January 30, 2013, lydiabennettape.com went online, with a promise to release a video of “Youtube star Lydia Bennet reveal[ing] EVERYTHING” on February 14. Yeah, that’s right. Valentine’s Day. Just to make it worse. Through the efforts of Darcy and his sister, Gigi, the site is thankfully taken down before the video’s release. But the damage on Lydia is done, and it will take a good amount of time and family support for her to truly recover. And longer before she’ll trust another guy with her heart. 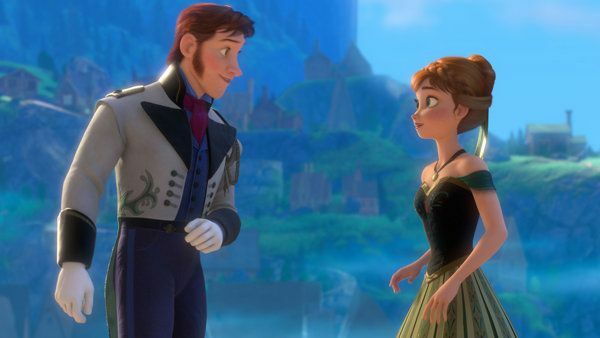 So, when I saw Frozen eight months later, I watched as Hans literally bumped into Anna, saw her attraction, and was immediately polite and gentlemanly. Even more so when he found out she was the princess. I watched as he swooped in just when Anna was wounded by her sister, shared his story about his older brothers ignoring him, and made her feel wanted. Enough to want to marry him. I watched as he made himself indispensable to the kingdom, and took his sudden responsibility for it… very seriously. 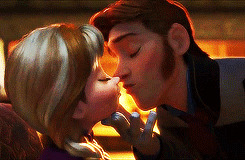 I watched as he claimed not to consider Elsa a monster… although he still left her shackled in her cell. I didn’t gasp. I wasn’t shocked. Sure, I thought maybe he was like Prince Edward in Enchanted – a true gentleman who just wasn’t meant for the girl. And I was taken aback by just how cold hearted (heh heh, see what I did there?) he turned out to be. But no, Hans didn’t shock me. Nor did I feel the need to make excuses for him. And it’s because of George Wickham, and what he did to Lydia. 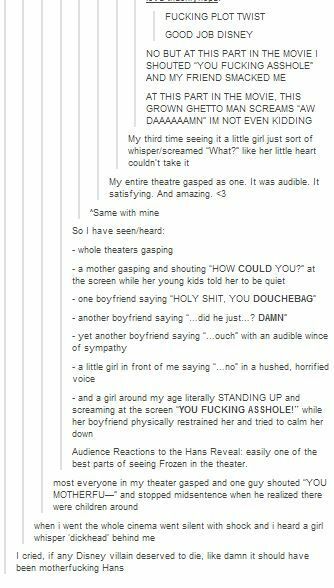 See, a lot of people think Hans’s story about his 12 older brothers ignoring him gives him a tragic past, a motivation, and maybe even makes him sympathetic. But George had a sob story too. And it was full of lies. And even when he owned up to it, he conveniently left out the part about breaking Gigi Darcy’s heart. 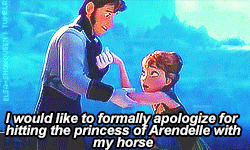 So, I wouldn’t trust Hans as far as I could punch him regarding his past. His was just one side of the story. “People make bad choices if they’re mad, or scared, or stressed,” as they say in Frozen. But Hans and George played it all very coolly. They had love, and they used it for power. Sadly, in LBD, George couldn’t get punched off a ship or thrown in the brig. But we can be thankful that his victims recovered and bonded with their families. And hey, George at least didn’t try to murder anyone. Either way, Prince Hans and George’s LBD incarnation are modern villains who reveal the form that cruelty is most likely to take towards young women – men with pretty faces, kind manners, and cold hearts. But, as great stories do, Frozen and LBD give us hope along with the warning. Both narratives are realistic in showing the victims feeling like it’s their fault for being taken in. But ultimately, no woman – no person – should be faulted for wanting to be loved. And it is only through love that loneliness and heartbreak can be healed – clear, open love and support of those who truly care about you. Sometimes that’s your family – your sisters, your brothers, your parents; and sometimes it’s your adopted family – your friends, your supporters and caregivers, and others you can trust. Through such love, as well as time and communication, you learn to love yourself again. To those watching their loved ones recovering from such relationships? Be understanding. Don’t judge. Just listen. They feel badly enough without any help. And if you are in a position of power, make sure people like this feel the burn for what they did. Don’t let it continue. Don’t let it matter how rich or privileged they are. 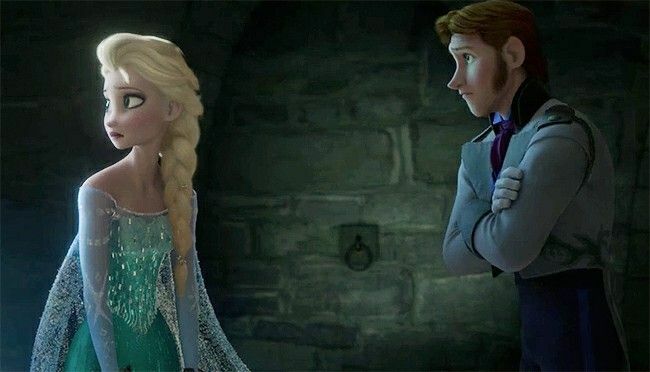 Arendelle was willing to sever ties with two powerful nations, one a trading partner, because their leaders chose to abuse their power and hurt others within their kingdom. William Darcy left his firm for weeks to personally chase down George Wickham, and paid a small fortune to buy out the company and stop the video – and Gigi Darcy had to face her personal demons to do it. Follow their example. And don’t do it because it looks good. That makes you like Hans and George – looking good, but not meaning it. Do it so no one else gets hurt. That should be enough. Although, again, punching the guy off a boat can be cathartic. To watch The Lizzie Bennet Diaries and associated vlogs, check out The Lizzie Bennet Diaries – The Complete Playlist on Youtube. For added in-universe tweets, check out the chronological list on the Pemberley Digital site here . * She was the fifth sister in the original P&P, but Mary Bennet was turned into a cousin, and Kitty Bennet was turned into…well… a cat. ** To clarify, she let him tape them being intimate because he pressured her. But she gave no permission to share that, as Lizzie had assumed. *** Thankfully she resisted this, but she hadn’t been around him very long enough for him to poison her the way George poisoned Lydia. Has they known each other longer, this could have gone down very differently.